Have you ever wondered, Why is this happening to me? or, How can I fix it? If you have, here's an opportunity to discover how to find the root(s) of a problem and then solve it. You may learn how to change your viewpoint to overcome difficulties, how to conquer fear, or kindle creativity. This incredible booklet written by Harold Klemp, the spiritual leader of Eckankar, is a jewel that you can use to transform your life. Order your free copy today by clicking this link Spiritual Wisdom 'at' eckalaska.org to request it, or, if you would prefer, you may ask for Spiritual Wisdom on Health and Healing instead. 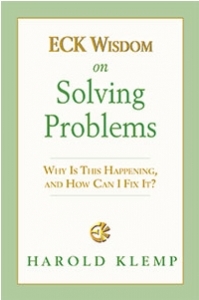 You may also order ECK Wisdom on Solving Problems from the main Eckankar Web site for $3 plus shipping and handling. The Alaska Satsang Society, a chartered affiliate of Eckankar, the Path of Spiritual Freedom, is pleased to offer you this opportunity. We do not share, or sell, your personal information and only use it to provide you with this free booklet.